I've heard it called a Boiling Water Dunk or the Hot Water Dunk. Basically, boil some water, let it cool a bit, and dunk the doll's hair in it. It sounded scary. I didn't want to hurt my doll (plus I couldn't find instructions, which I really wanted before I attempted it) so I put it out of my mind. But then I found them. Instructions on how to perform this scary sounding doll hair treatment.And so, I decided to give my Josefina (renamed Yanna) the hot water dunk. 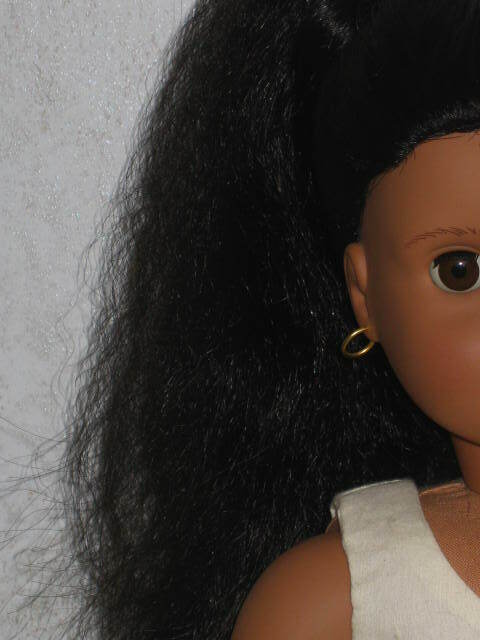 NOTE: DO NOT GET WATER IN YOUR DOLL'S EYES! IT CAN CAUSE ISSUES. 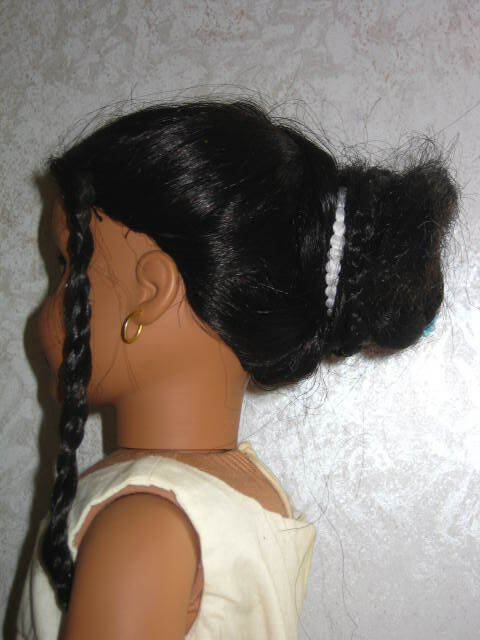 The instructions also said to try to keep the water aff the wig cap (the part nearest her head), especially with the hot water in later steps! 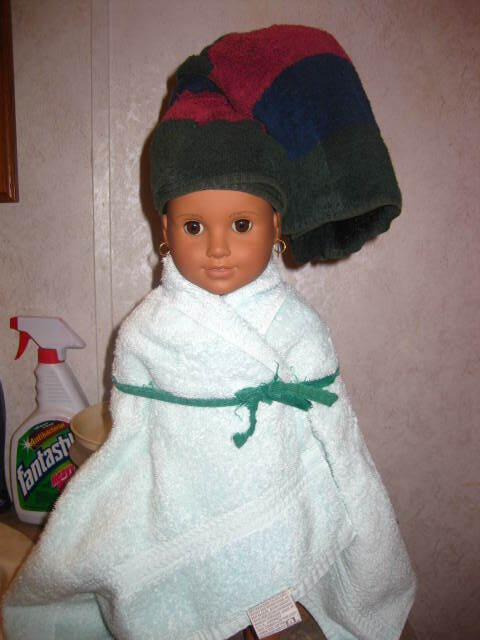 So the first step in the hot water treatment instructions I found was to wash the doll's hair. So I figured I should probably try to brush it, even a little bit, so it'd be easier to wash.
You can sort of see how bad it is towards the bottom. Towards the top is still nice, but with the bottom so bad, it was a nightmare to try to brush out. Her hair looks almost textured, but it's not supposed to be. After the wash, I wrapped up her hair so it wouldn't drip all over the place. I wrapped her in a towel to protect her body, and I draped the washcloth over her face to keep her face dry. 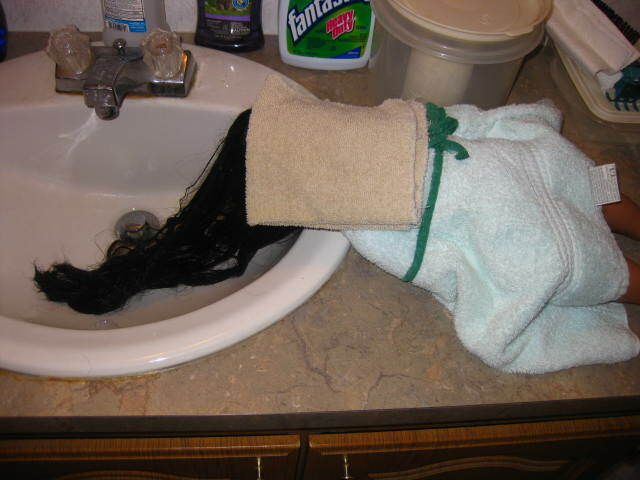 Her wrapped up hair after the wash.
After the hair is clean, you boil some water. 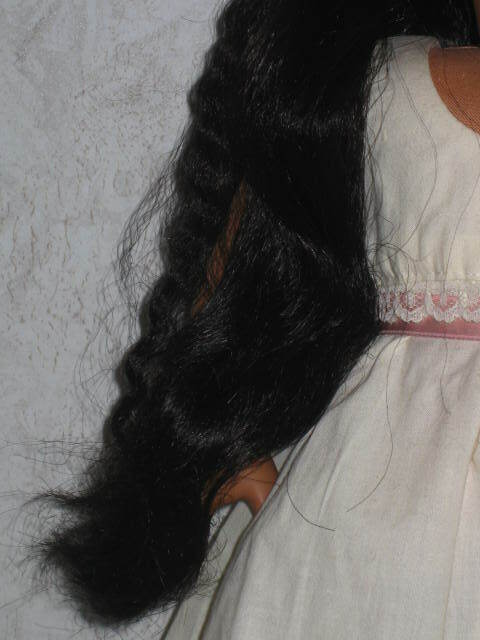 I used a large stock pot since Yanna's hair is so long. After the water reaches the boiling point, you turn off the heat, remove the pan from the stove, and let it sit for 5 minutes. 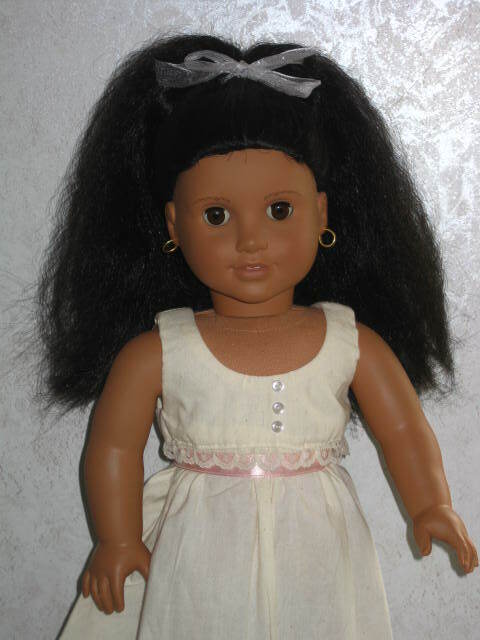 After the 5 minutes, you dip the doll's hair in the hot water and then brush. Make sure only her hair gets wet, and not her face or head (wig cap). I dipped Yanna's hair for the recommended 4-5 times, then brushed it, but it still didn't feel right. So I dipped it a few more times, then brushed it again. That time it felt right. After I liked the way her hair felt, it was time for her hair to dry. 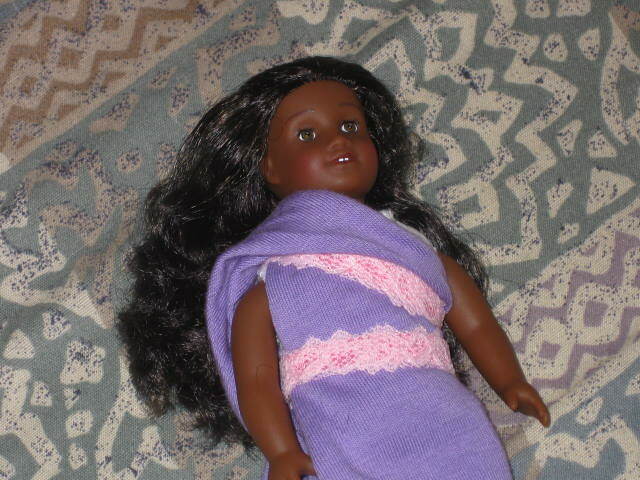 I finished this at night, and the next day (around noon I think) her hair was dry. 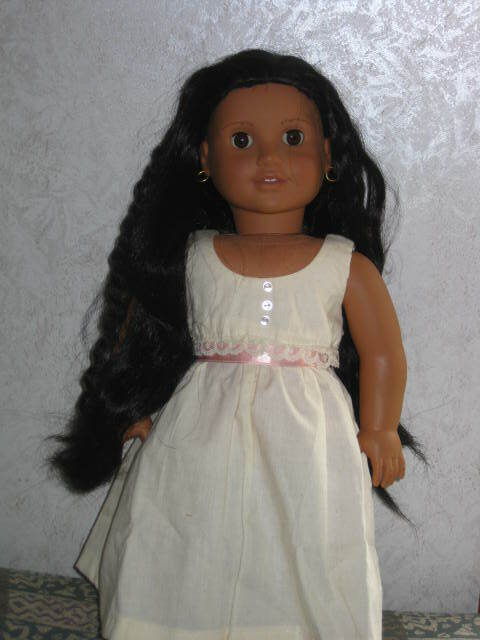 NOTE: I am not responsible for anything that might happen to your doll if you try this. 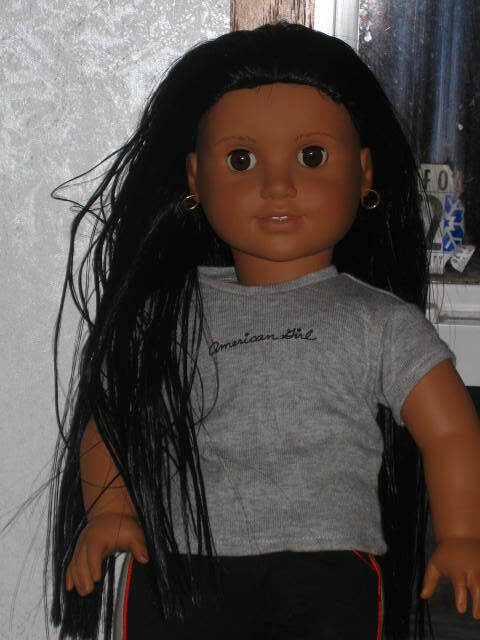 I've done this with a 18" & a mini AG, and no harm came to mine, however, I can't promise nothing bad will happen to your doll. 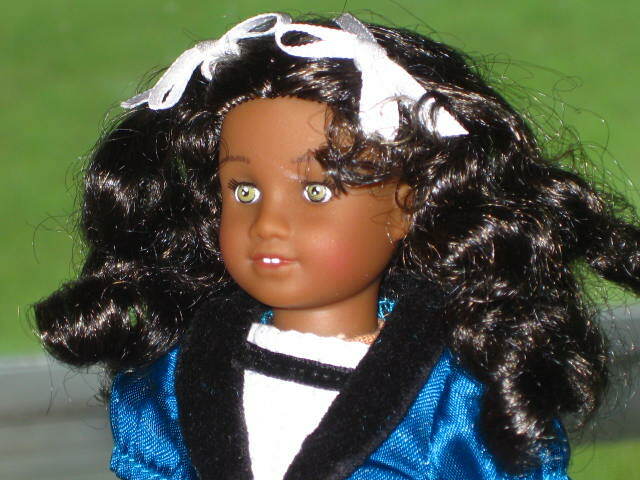 Please be careful while handling your doll near the hot water, and like I mentioned above, take steps to try to keep water away from your dolls eyes (and the hot water off the wig cap). My mini-Cecile before the dunk. Her hair was a wild mess of impossible curls. And after I tried brushing her hair (what can I say? it worked with 18" Nicki...), it was a mess of impossible frizz. Irritating at best, maddening at worst. I'm glad I didn't pay full price for her (she was on clearance). And yes, I did darken her eyes. 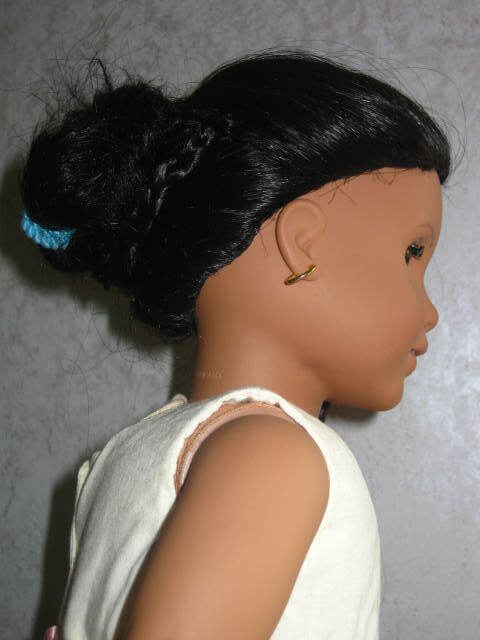 I wanted her to be a mini-me for my Sonali. 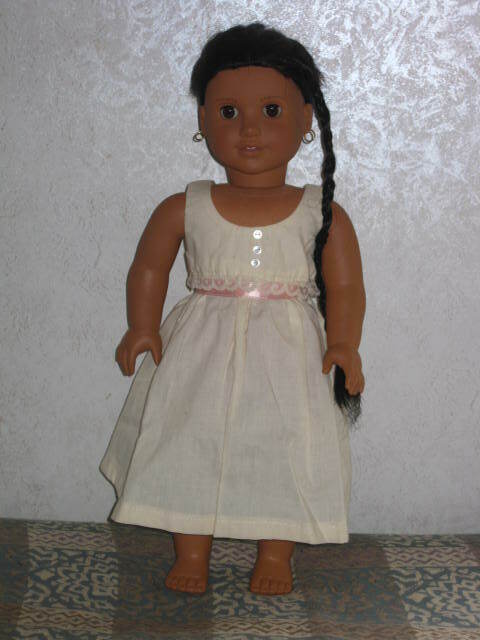 American Girl Snowy Chic mini dress (for the mini, her meet outfit and a scrap-turned-sari.